“Circuitry is technology. Without circuitry there are no computers. But I got into circuitry to get away from computers. It’s truly weird.” That’s circuit bender and music-effects-guru Drew Blanke, aka Dr. Blankenstein, on his love of the tiny devices that enable or inhibit the flow of electricity through a machine. For him, electricity is not a means to an end, the passive power that allows you to watch every episode of “Adventure Time” or code on your laptop until dawn. No, for Blanke, electricity, along with the wires and circuits that carry it, is the instrument itself. 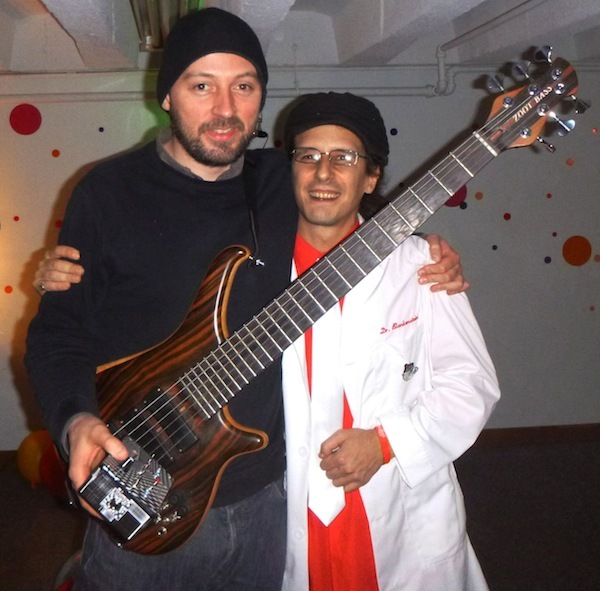 Above: Dr. Blankenstein with Squarepusher, holding the Sonic Crusher that Blanke made just for him. Top: A sneak peak at version 2.5 of Blanke’s Atari Punk Console. 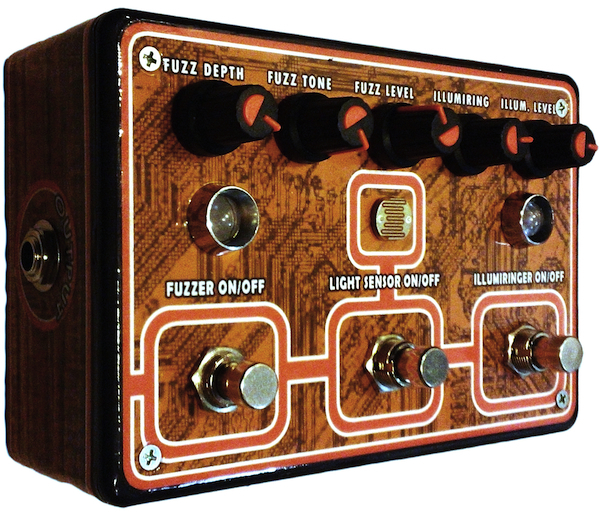 In fact, Blanke is an unabashed fanboy when it comes to circuits, the visionaries who turned them into instruments, and the musicians who manipulate them, going so far as to make one-off effects boxes for some of his current musical heroes. For techno musician Tom Jenkinson, aka Squarepusher, Blanke made the Sonic Crusher, which he describes as a “vocal processor, audio scrambler, robot box.” He personally delivered the distortion device to Squarepusher at MoogFest 2012 in Asheville, North Carolina. More recently, in the spring of 2013, Blanke loitered like a groupie outside the stage door of the Brooks Atkinson Theatre after attending a performance of the Broadway musical “Hands on a Hardbody.” His goal? To give a one-of-a-kind version of an effects box he calls the Illumiringer to Trey Anastasio of the jam band Phish, who composed much of the music for “Hardbody” and whose playing style inspired many of the Illumiringer’s coolest features. When presented with the heartfelt gift, Anastasio was all smiles. 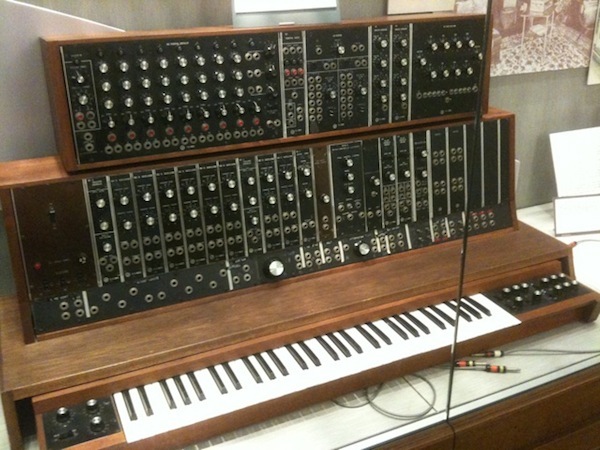 The first Moog synthesizer, commissioned by the Alwin Nikolai Dance Theater of New York in 1964. The machine is now part of the Stearns Collection, University of Michigan. Looking back on those formative years, Blanke realizes he almost missed the Heathkit party. “Unfortunately, 1986 was a really bad time to get into Heathkit because they went out of business a few years after that.” Blanke was not even alive during the formative years of Moog in the mid-1950s, when Bob Moog made his fledgling company’s first Theremin kits, or even during its heyday in the late 1960s, when the Moog movement exploded a few years after the first Moog synthesizer prototype was unveiled in 1964. Today, thanks to digital technology that uses software as well as hardware to produce music, musicians can make just about any sound they want on a basic iPad. This has led to a kind of democratization of sound, which most observers applaud, but digital-musical devices have also turned sound into just another commodity to be exploited and spat out by anyone who can get their mitts on it. Obviously the ability to produce any sound cheaply and on command is convenient, but when sound ceases to be special it often ceases to delight, becoming a mere means to a soulless, predictable end. 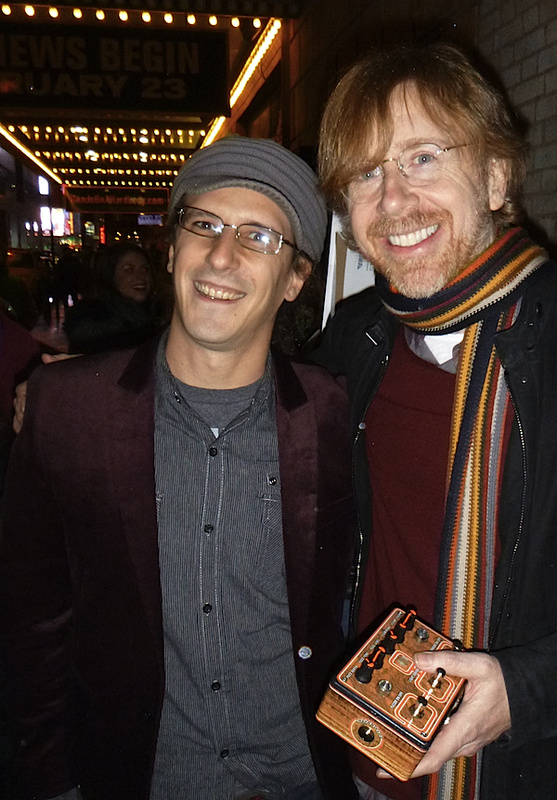 In 2013, Blanke presented Trey Anastasio of Phish with an Illumiringer he designed for the guitarist. That’s where Blanke and others like him come in, providing musicians with more than just cool tools that ape or contort sound. Instead, Blanke is building an entirely new line of experimental, electronic instruments, which he assembles by hand in his Manhattan apartment, like a luthier crafting a fine guitar (only with lots more soldering). The effects produced by Blanke’s instruments vary wildly, but the basic principle behind them and any other analog electronic instrument is essentially the same. Like many of Blanke’s electronic instruments, the one Blanke designed for Trey Anastasio features a light sensor to produce Theremin-like effects. To put it as simply as possible, an electrical current wants to move. For example, when you plug a vacuum cleaner into a wall receptacle, the current immediately flows into it. The vacuum cleaner would turn on instantly if a switch did not interrupt the current. When that switch is flipped, the vacuum cleaner starts up and you can get on with your housekeeping. 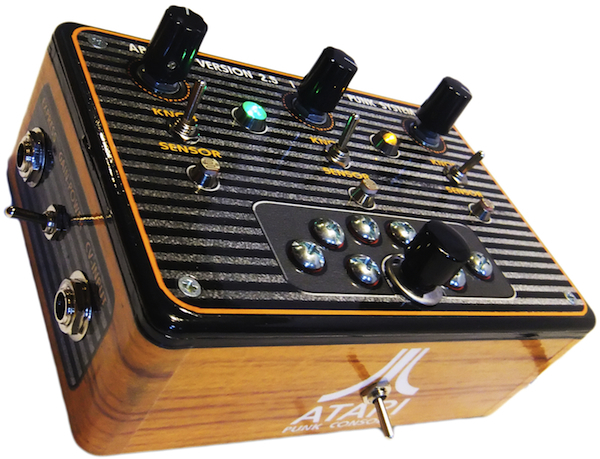 Similarly, in Blanke’s devices such as the Atari Punk Console, users can stomp on buttons, turn knobs, and use light like a poor-man’s Theremin to control the flow of electricity into an analog chip, which is simply a collection of tiny circuits packed together like so many angels on the head of a pin. The chip acts as an oscillator, which in turn regulates the amount of voltage flowing through the device and out to a speaker, so you can hear what all that oscillating voltage actually sounds like. Blanke’s Illumiringer wiring and its chip (at top) can be installed into a guitar. The author installed a similar “mod kit” in his Danelectro. The Illumiringer runs on a different chip (in this case, the same chip that was once used as a tone decoder in telephones) and gives a musician even more controls over the signal passing through it, via a light sensor, several touch points, potentiometers (most people know these common pieces of hardware as “knobs”), and expression pedals, all of which allow the user to vary the resistance of electricity flowing into different parts of the chip and then out again. Now my Danelectro, however beloved, is by no means a rare or valuable instrument. It was made sometime in the 1990s, cost me less than 200 bucks, and has survived the abuse of two male high-school students (our children, now full grown) and their friends. But when Drew Blanke enthusiastically told me how cool it would be to drill eight holes in my guitar, the Danelectro instantly became my baby, and the prospect of chickening out and just plugging the thing into an iPad started to sound pretty good. 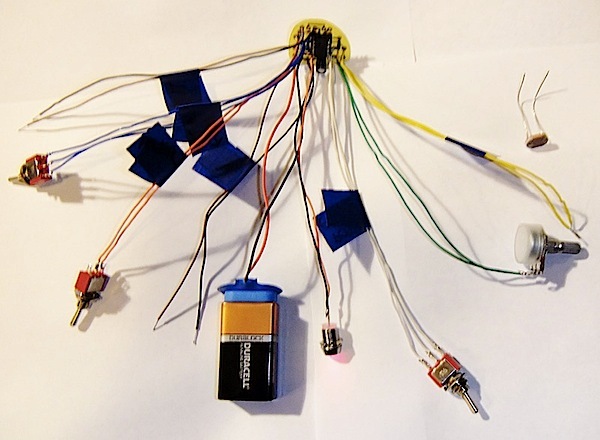 When an envelope stuffed with a light sensor, a pair of LEDs, no less than five switches and knobs, and a rat’s nest of wire connected to a sinister-looking circuit board arrived, I became downright alarmed. All right, already! Finally, one Saturday, I took the strings off my guitar and removed the neck to make it easier to work on, and then began to mark out the spots where I would drill. I measured once, twice, three times, and more, to make sure the holes I was about to drill in the face of my guitar were going to correspond to the access port in the back. Just to be safe, I checked my measurements a couple dozen more times before finally drilling that first hole. After that, I couldn’t stop. Frankly, it was fun to drill holes in a perfectly good instrument. In the end, I lined up the three potentiometers, which regulate effect’s volume, the effect itself, and the effect’s tone (from “wet” to “dry”), in a reasonably neat row just above the guitar’s existing pickup controls. At Blanke’s suggestion, I put the toggle switch between the yellow and green LEDs to indicate whether the guitar is in sensor mode (yellow) or knob mode (green). And I placed the on-off switch for the mod itself as far away from the action as possible. That left the sensor, which I had wanted to put under the strings as Blanke had done in one of his online demos. Unfortunately I could not get to that part of the guitar from the instrument’s access port, so I just stuck it in the only place that was left where it would fit. As blind luck would have it, it turned out to be a good spot, better, I think, than under the strings. Blanke has given his Illumiringers numerous graphic treatments. This one is the Star Wars edition. With the help a friend who is an ace with a soldering gun, the connections were eventually made, I put everything back together, and much to my complete surprise, it worked. 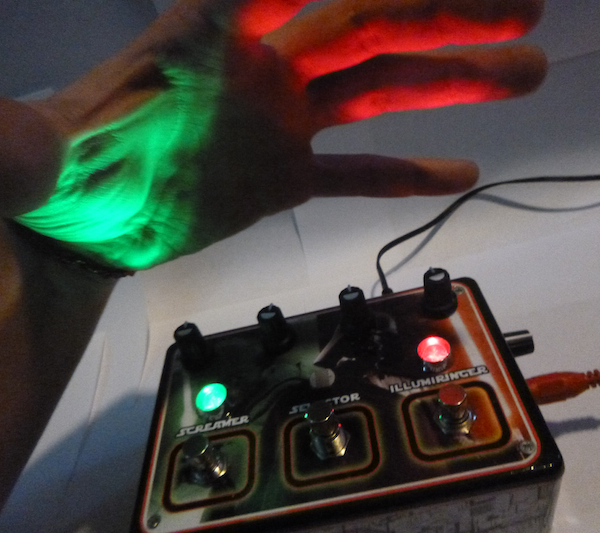 You can still play the instrument like any other electric guitar, but if you flip the on-off switch, all of a sudden you are in Illumiringer-land, which you can navigate via a knob (indicated by the green LED) or a light sensor (indicated by the yellow). Now I find myself noodling otherworldly sounds late at night, no doubt to the mystification, and chagrin, of our next-door neighbor. “Analog circuitry,” says Blanke of the stuff inside my Danelectro, “is probably truer to a guitar than picking up a Raspberry Pi and writing a distortion algorithm on a computer.” I’m not sure what that would entail, and I don’t think most people would describe many of the sounds coming out of my guitar as music (when the volume knob is opened up all the way up and the wet-dry knob is turned as far as it will go to “wet,” I’m certain music is not the right word). But I can definitely see how someone could take the sounds I’m stumbling upon and weave them into something else that a lot of people might dance to. Blanke’s workbench in his Manhattan apartment. 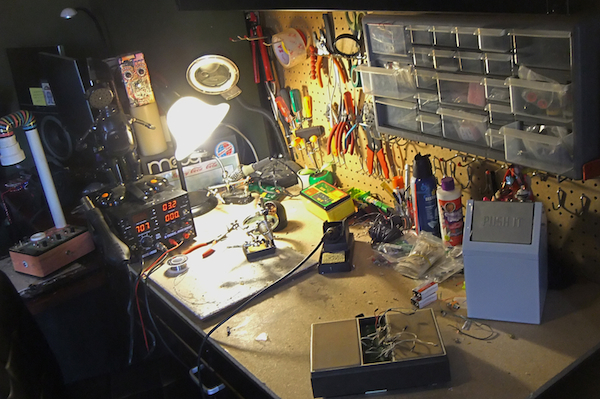 Note the Heathkit doorbell unit in the foreground at right, the same one he made with his dad when he was a kid. Great peek into Blanke’s life, thank you. One quibble: So, it’s only music if you can dance to it? The 20th Century called, they want you to learn about what happened in music history. “ ” Young women identified with her independence, even if they could not yet claim it for themselves.